OK seriously, this is the kind of deal that’s far too good to pass up. Amazon just released its new Fire TV last week, and it’s easily the best streaming device you can get for $70. But there’s a special deal right now that makes it even better. If you opt for this special bundle right now you can also get an HDTV antenna that gives you access to free live network TV in full HD 1080p resolution… for free! Definitely grab an All-New Fire TV with 4K Ultra HD + HD Antenna bundle while you can. No cable or satellite? No problem. 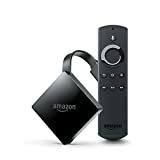 Includes an all-new Fire TV and an AmazonBasics Ultra Thin Indoor HD TV Antenna (35 Mile). Save compared to when purchased separately. Just connect the AmazonBasics HD Antenna directly to your TV to receive local HD broadcasts from major networks such as NBC and PBS. Get live sports, local news, late night shows, and more. Specific channel reception depends on broadcasts available in your local area.